Ramona's Voices: Is There Nothing Sacred in this Country? "Hundreds of buildings commissioned by the Works Progress Administration and Roosevelt’s other 'alphabet' agencies are being demolished or threatened with destruction, mourned or fought over by small groups of citizens in a new national movement to save the architecture of the New Deal." We have a nasty habit in this country when it comes to old buildings. We refuse to see value in them once walls begin to crumble and windows begin to fall out. No matter their history, when the time comes that they require some major TLC (and it will. They're OLD!) they become liabilities and committees quickly form to figure out how they can get around that old historical nostalgia thing and convince the public that an old building is just an old building and even when it's gone they'll still have the memories. If you've gone across this country anywhere at all, chances are you've seen something that was built as part of Roosevelt's WPA Project, designed to put millions of people back to work in the 1930s. You've seen beautiful bridges, roads, parks, and public buildings. You've seen murals in railroad stations and libraries, commissioned by the New Deal visionaries, and painted by out-of-work artists. 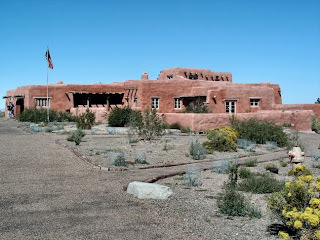 The Painted Desert Inn at Arizona's Petrified Forest National Park was a WPA project built in the 1930s by the young men and boys in the CCC (Civilian Conservation Corp) . 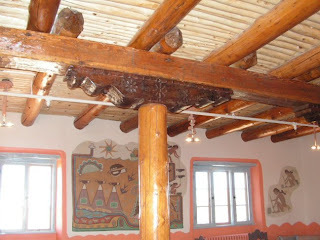 We visited it a few years ago, and I was completely enthralled by the work that went into it. As a works project during the depression, the designers and facilitators could simply have put up a utilitarian building and left it at that. But they made it a work of art to complement the stunning beauty of its surroundings. In my online travels researching this post, I found this remarkable website with photos of some of the other WPA projects across the country. It's not complete by any means--there were thousands--but it gives an idea of the scope of the projects, and, more importantly, the worth. You've seen the heartbreaking photographs of Dorothea Lange and Walker Evans and you've read the clear and poignant words of writers like Eudora Welty, Saul Bellow, John Cheever, Richard Wright and Zora Neale Hurston--all employed by the government during the days of the WPA. "I saw and approached the hungry and desperate mother, as if drawn by a magnet. I do not remember how I explained my presence or my camera to her, but I do remember she asked me no questions. I made five exposures, working closer and closer from the same direction. I did not ask her name or her history. She told me her age, that she was thirty-two. She said that they had been living on frozen vegetables from the surrounding fields, and birds that the children killed. She had just sold the tires from her car to buy food. There she sat in that lean- to tent with her children huddled around her, and seemed to know that my pictures might help her, and so she helped me.There was a sort of equality about it. " Yes, the New Deal WPA programs were make-work projects. And yes, they could be considered entitlements, since their work wasn't what most would consider "necessary". But oh, the treasures they produced! (Deny that, you dolts in Washington, who still believe, all evidence to the contrary, that the heart and soul of this country lies in keeping the Upper Class uppermost). Ada Redford: "What do you think caused the depression?" Clifford Farr: "It would take a more brilliant mind than mine to tell you the real cause. My ideas along with a lot of other small merchants is about the same. It was Wall Street against the world, along with a political upheaval, in other words, a Republican trick. Millionaires were made over night from the life savings of others. The war got the credit for a lot of and rightly so. I remember the close of the Spanish American War; cotton dropped to 3 1/2 and 4 cents a pound, why? Politics and the little man being crushed and beggared by the man or men who were in power. Take my business for instance; before the last depression fourteen families were being supported from it; my own personal loss was 50%. I was worth around $40,000 with an income of $5,000. That was cut in half and today my average is a little more than $3,000." Ada: "What to you think of conditions today?" Clifford: "They are about the same as the pre-war days of the last World War. When this program is over, there will be an increase in business. The present administration is wise now to all the Republican tricks and there will not be another depression such as Hoover and the Republicans caused. The people in our country know now that it was a political trick to enrich the big man and make beggars out of the little man. We have more unemployed than any other country in the world today, and the cry is that this is a machine age. That is true, to a great extent, but who built the machines? Where did the money come from? Out of the pockets of the working man? Again I say, 'Wall street against the world.' "
These words, those photographs, along with the thousands of other treasures that came out of the New Deal, not only should be, but must be preserved. There are tribes of dangerous power-mongers who want to re-write history and ignore the obvious signs of a country turning back on itself, but we can't let that happen. Those buildings, those parks, those bridges, those artworks, those words, were crafted by a people who came out of a darkness artificially created by hubris and greed. They built a new America for us. The least we can do to preserve the memory of those hard times is to preserve the wonders their hard labor created after the New Deal administration finally saw the light and gave them hope. Just as sad as the "structural neglect" is the "spiritual neglect" that seems to have taken over our collective consciousness regarding work from the New Deal era. 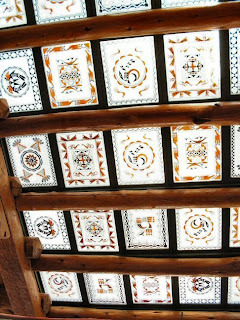 Certainly the work to preserve the Painted Desert Inn is noteworthy, but I'd also point out the fact that the folks in charge there seemed not the least bit interested in having members of the CCC participate in any of their anniversary events - I'm president of the Arizona chapter of the CCC Legacy and I know because I tried to get them interested. Our society will forget the workers along with the work. Michael, I'm sorry to hear that. What an odd decision--not to have CCC members at their Anniversary events! When we were there, a young man took us around and seemed proud to show us the work of the CCC. They certainly weren't trying to hide it under the carpet--so I'm really curious to know why they weren't out shaking the bushes to find anybody who had ever helped build the place? In Michigan, we have a CCC Camp museum in Higgins Lake State Park. 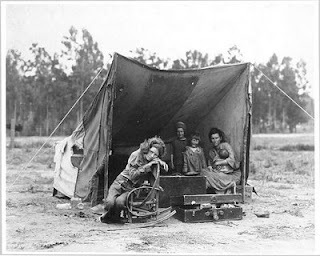 Very interesting, with tents, and camp cots and blown-up photos of life in the camps. We met a man there who had worked for the CCC as a boy. He was proud of what he had done, and I don't think he's going to let anyone forget it. There are a whole lot of us who won't let anyone forget about the New Deal, the WPA or the CCC. Thanks for commenting. It's interesting to hear another perspective. Not long ago, PBS did a series on some of these WPA projects; especially noteworthy, were the paintings that were done and are on this site. My father worked on the WPA planting trees on the highways and I would like to believe they are still there. During those years, we lived in Northern Michigan and we lived a very simple life. I am surprised and yet not so. Not long ago, I read about some of the cities that were razing some of the old neighborhoods when the housing boom was in force and they were taking over neighborhoods in the name of progress and profit, of course. Interest also to note is that my youngest son Philip lives in one of the original 30s houses of California Cottages and I am pleased to report that his house is not considered valuable and is protected in California. Sad to say, that is not the same countrywide. It would be a stimuls to have these historical landmarks remain as reminders and monuments to the creativity and industry of another era. Thanks so much for the extensive research and excellent writing. Philip's house is considered valuable; have to keep the record clean here. I would have loved to have seen that program! I'm an addict when it comes to studying the Great Depression and the New Deal, including the WPA/CCC. I'll be bringing it up often here, because valuable lessons can be learned today by examining how that sad era was handled. thanks for finding my blog. I followed you home. I lived in KC, Missouri until 2 years ago. Murals inside my bank and at my school [UMKC] were part of the New Deal art projects. They were lovely. It seems immoral to me that the New Deal projects are being torn down. Especially now, we need to take lessons from our past. Two Crows, thanks for visiting. I hope those KC murals are safe and sound and still there for everyone to see. I think there are a whole lot of people in this country who would like to sweep the New Deal successes under the rug. "Roosevelt CAUSED the Depression" is the new Right Wing battle cry. Shame on us if we can't get a New Deal up and running real quick. 600,000 new unemployed in January alone. That's terrifying. when I left school, the one at UMKC was still there. and the one at the bank was there when I left town. still, Bank of America had just bought that bank -- so who knows how long it will survive? yes, I hear the same lies from the Rethugs about Roosevelt causing the depression. these people have no shame. of course, since it was a Republican president who did nothing and a Democrat who fought against the Depression -- who can blame them? but then, they'd love to follow Hoover's lead again -- and we saw where that got us back in the 1930's. yep, Obama needs to put pen to paper, and quickly. sadly, the original has been watered down with tax cuts [just as if that approach hasn't been tried and failed more times than I can count]. still, we've got to get moving before even more bad news comes down the pike. I'm furious about those tax cuts. We didn't need them! Jobs, infrastructure, health care--forget the tax cuts. You can't stimulate the economy unless people are working and buying. He has to forget about the Republicans and get on with it. They're useless obstructionists better left in the dust. Whining babies!